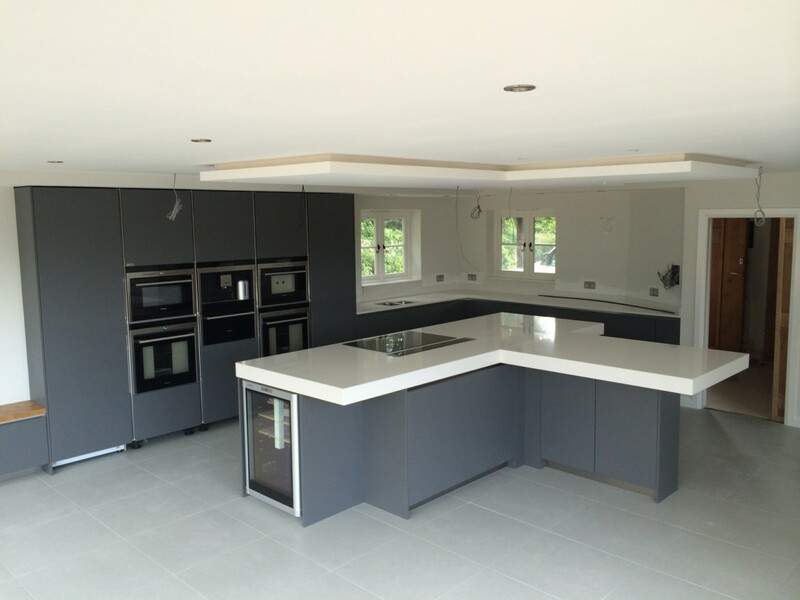 As specialists in contemporary kitchens we love it when our customers are set to fully embrace the Black Rok ideal; big, handleless kitchens that seamlessly integrate the very latest technology are becoming something of a forte for us. And as luck would have it, that’s exactly what this particular customer wanted. Their property was to be extended to allow for a large kitchen-dining-living area, finished with vast banks of sliding glazed doors. Incorporated within the kitchen was to be the very best in Siemens integrated appliances, including two full size ovens, a microwave combi, a steam oven, a coffee machine, a warming drawer, a full size integrated dishwasher, a zone less flexi induction hob , a full height A-cool fridge, a full height A-cool freezer and a built in wine cooler… oh and a downdraught extractor that rises up from the island worktop. 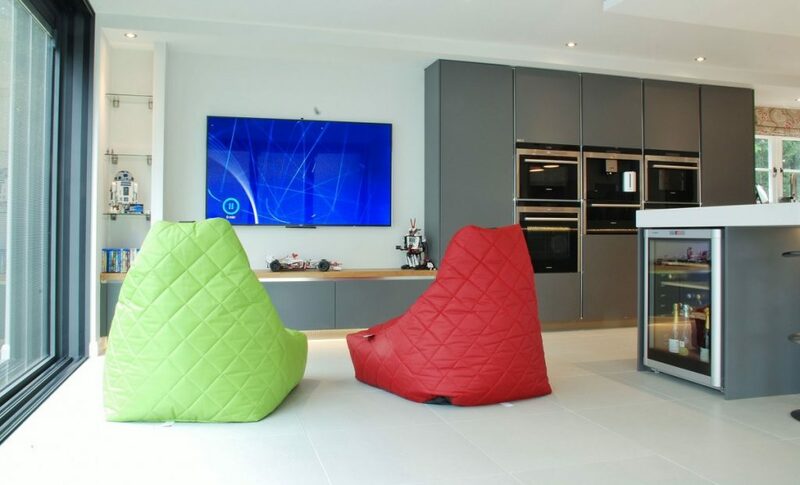 The kitchen also needed to blend seamlessly into the TV zone whilst offering ample storage with drawers and pull-outs complete with seating on the island for five. The shape of the space lent itself to a big “T” shaped island with the big bank of tall-units and the sink run set against two of the walls. Our customer decided on a satin lacquer grey door with handle-less cabinetry. To bounce the light around we used an off-white Quartz, built up to 100mm, this set the tone with the stunning overhang on the island creating a beautiful seating area for all the family. 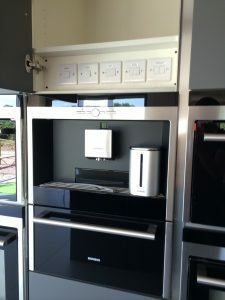 To accommodate all the technology we configured a bank of five tall units whilst on the island a bank of beautifully accessorized drawers sits below the induction hob and downdraught extractor. To the right of the tall units the sink sits nicely in front of the window, complete with full sized dishwasher and pull-out waste bins and recycling. Further storage runs along the end wall whilst to the left of the tall units we designed the TV zone. Here we built a false wall into which we set a run of low level units and a column of LED illuminated glass shelves. There is so much to this kitchen that it is hard to know where to start. The first thing that strikes you is just what an amazing space it is. The huge glass doors coupled with the sheer size and scale of the kitchen make you feel like you’ve just stepped into a movie set. That changes the second you begin to touch and use the kitchen though, suddenly it’s more like being in a very expensive car showroom, a luxury, German car showroom of course. But the feeling of solidity, the reassuring weight of the doors and drawers, coupled with the beautifully tactile surfaces give such an overriding sense of quality it’s hard not be impressed. 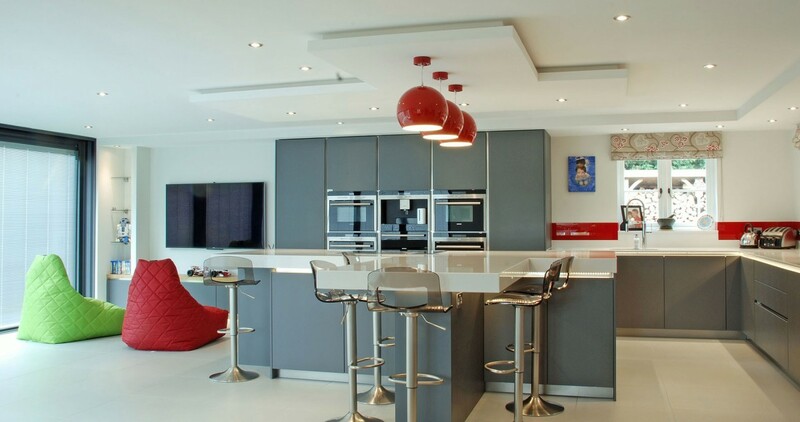 The installation, and especially the attention to detail, are what make this kitchen so good. For example, check out the bank of isolator switches above the coffee machine, neat, tidy and super functional. And you find details like this all over the kitchen. 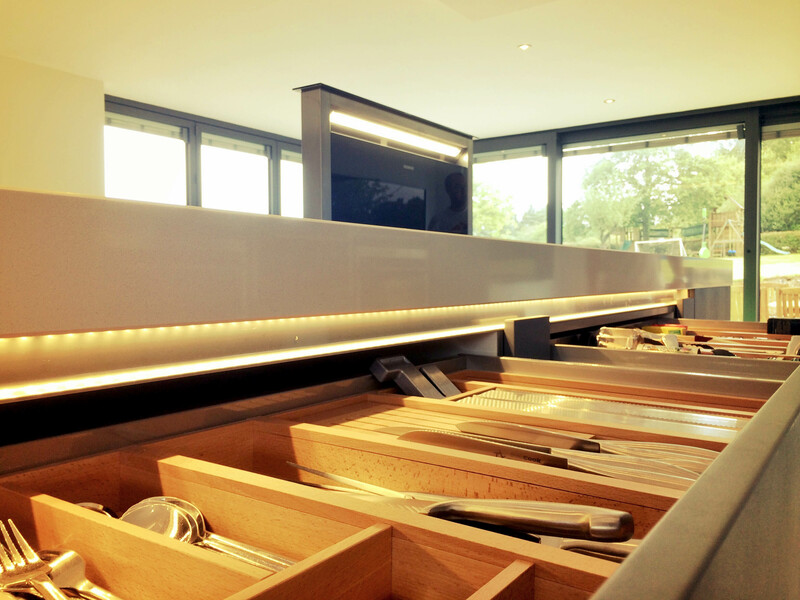 LED lighting illuminates the stainless steel handless channel detail, drawers are beautifully accessorized , the 100mm quartz worktop with stunning overhang detail, the stainless steel plinths… the list could go on and on. Every now and again a kitchen so beautifully encapsulates what we do that we wish we could pick it up and put in our showroom; this is definitely one of those kitchens. 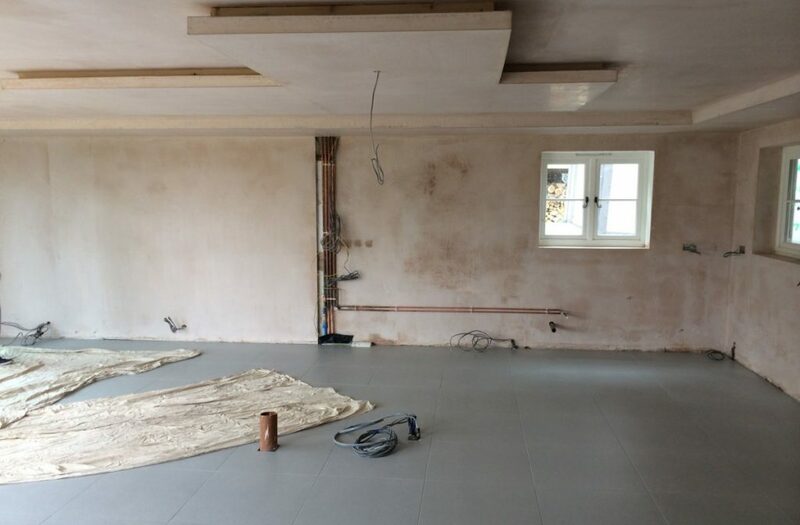 “We had wanted to upgrade our kitchen and create an open living area for quite some time and we knew it would be a significant investment in the value of our house. 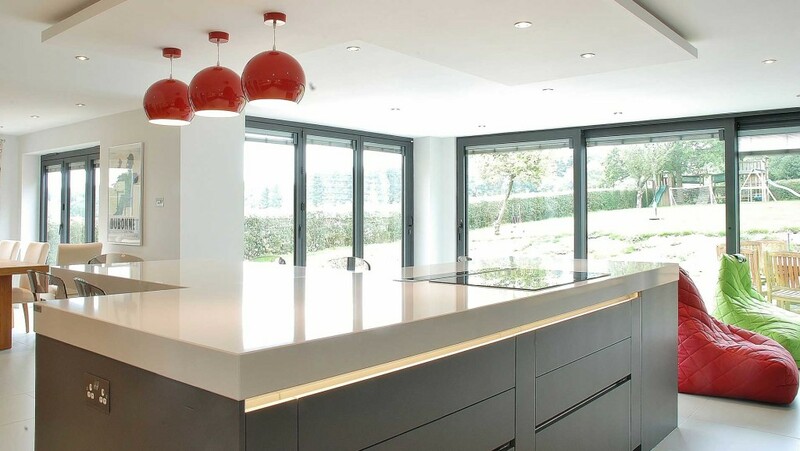 Much thought was put into specifying the kitchen itself with visits to national shows to gather ideas. The big hurdle we faced was who to choose to make this dream a reality and to do it justice. Black Rok have been superb from the start. 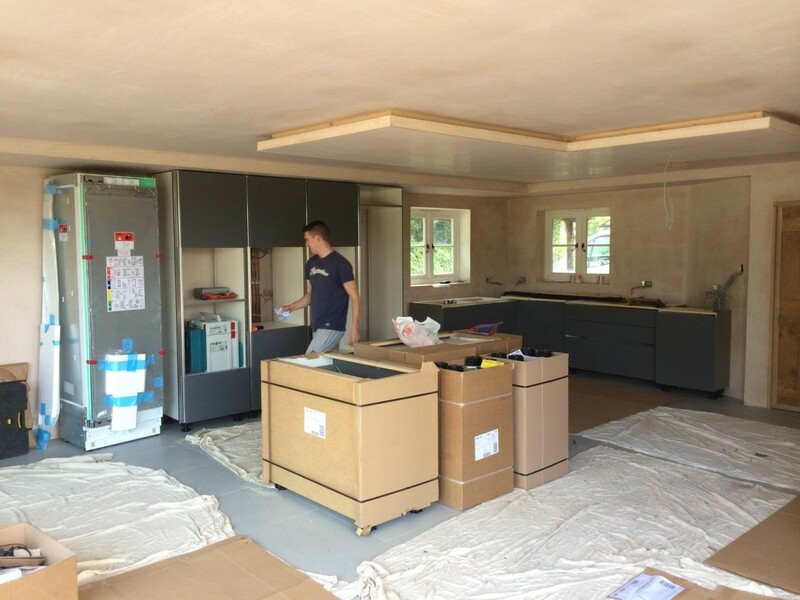 They showed incredible patience with us during the design stage and numerous changes of mind on style, colour scheme, this work top, that work top and what size and shape the main feature island would be. Each step of the way our thoughts were accurately reproduced in photo-realistic designs that made it really easy to visualise our plans. Sound advice and design expertise was on tap and readily accepted. How nice also to see the designer actually involved in installing the kitchen too! No contract kitchen fitters here! We felt that Black Rok were as emotionally committed to the project as we were and dedicated to the fine details.